Pet Towels and Body Wipes help in quickly drying off your dog after the bathing. A separate bath towel is needed for your pet dog as the regular grooming gives the towel a permanent odour. We at PetsWorld provide you bath towels made of high-quality material which can also be machine washed. Body wipes are also available which are alcohol-free for making it suitable for all dog breeds. The body wipes offered by PetsWorld is appropriate for both dogs and cats. They are anti-microbial for soothing the itching and scratching in dogs and also to prevent allergies. They are pH adjusted which suits all skin types and helps in removing the dirt and debris from the skin and coat. With the help of the body wipes, ears and paws of the dogs can also be cleaned. 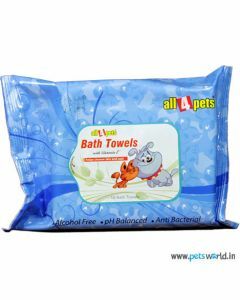 On the other hand, the pet towels are super- absorbent pet towels made from 100% rayon for thorough grooming of your dog. The best thing about the pet towels is that they are soft and easy and can be reused, thus avoiding the need for multiple towels. The fast drying capability of the towel keeps the grooming time of your dog very short.